Property Size 1,706 sq. ft. 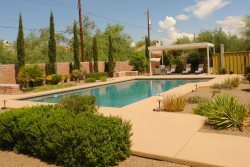 This serene and private home is located NW of Tucson in the new community of Continental Reserve. The property has two full bedrooms plus a den with a high-end sofa sleeper. The spacious kitchen is upgraded with granite counter tops and newer appliances. This home also has a private pool and spa in the backyard as well as a two car garage for your convenience. The community of Continental Reserve is located off of interstate 10 providing easy access to both Tucson and Phoenix airports. Groceries, shopping, medical care, movie theaters and dining are minutes away at the Arizona Pavilions Center. This is a very lovely and relaxing home with high quality furnishings throughout. Set in a quiet neighborhood with desert and mountain views. Plenty of room for entertaining guests or clients, or simply sunbathing by the pool. Great for a vacation home or a corporate rental. Tennis and basketball courts in community. Golf and hiking nearby. The pool is heated for an optional weekly fee.